The Bengals are counting on some new coaching roles making a major difference this season. Marvin Lewis survived another year on the hot seat but knew he would need to rearrange his staff after another disappointing season. Teryl Austin will succeed now-Raiders DC Paul Guenther in running Cincinnati’s defense, and Lewis made Bill Lazor the full-time OC. The team jettisoned longtime offensive line coach Paul Alexander as well, with other new staffers coming in to help a team that’s fallen in the AFC hierarchy the past two years. “I made up my mind I wanted to coach,” Lewis said, via Jonathan Jones of SI.com. “So, do I want to go start over somewhere where I don’t know the people or coach these group of guys downstairs that no one else has? That’s an easy decision. You look at what’s open and these are the best players. And that’s what you want. Lewis added that he didn’t want to make wholesale roster changes, pointing out the number of Pro Bowlers still on the team, but the Bengals aren’t receiving much attention as a contender this season. They’re hoping these staff moves can re-route them back to the AFC playoffs. The Eagles received a scare Thursday night when Super Bowl MVP and temporary starting quarterback Nick Foles went down with a shoulder injury. The shoulder sprain Foles suffered is believed to be a minor malady and not one that will require a significant rehab effort, Ian Rapoport of NFL.com reports. It’s looking like it will come down to the wire on whom the defending Super Bowl champions will start at quarterback on opening night, with Carson Wentz unlikely to play in the preseason. The Eagles not having Foles would throw a major wrench in their plans, despite third-stringer Nate Sudfeld having a nice offseason. Steven Nelson will be a full-time outside cornerback this season, Lynn Worthy of the Kansas City Star notes. This change emerged in the offseason, one that featured breakout slot man Kendall Fuller’s arrival, but the Chiefs are evidently committed to trying Nelson – their most frequent slot corner over the past two seasons – as an outside man. The 2015 third-round pick is entering a contract year. While Kansas City has looked at other corners this month – Bashaud Breeland and Orlando Scandrick – the trio of Fuller, Nelson and David Amerson remains atop the depth chart. Nelson did leave the Chiefs’ game Friday night with a head injury, however. Former Jets second-round pick Stephen Hill and ex-Titans backup quarterback Zach Mettenberger are two of the notable new names signed on to play for the Alliance of American Football. The AAF announced 100 more players will join. Ex-Rams running back Daryl Richardson, former Saints and Jets ball carrier Khiry Robinson, linebacker Deontae Skinner and running back Storm Johnson are among the new contingent. Former Giants and Ravens safety Will Hill and veteran kicker Nick Novak, who was with the Chargers last season, were among the first wave to sign. Another offensive line regular will land on the Giants’ injured reserve list. The Giants placed D.J. Fluker on IR Monday, ending his season, Adam Caplan of ESPN.com reports (on Twitter). 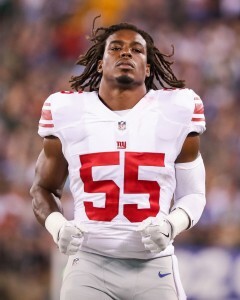 A toe injury will lead Fluker to IR, and the Giants’ IR list will now stand at 19 after Big Blue also placed linebacker Deontae Skinner on the season-ending list. Defensive back Donte Deayon and linebacker Curtis Grant are going on IR as well, per Caplan. There are only three open roster spots because the Giants signed linebacker Jeremy Cash to help add depth on its defensive second level, James Kratch of NJ.com tweets. Fluker started six games for the Giants after signing a one-year deal in a presumable attempt to re-establish his value. The Chargers backed out of his fifth-year option in March, and the Giants added him soon after. Skinner played in three games for the Giants, and Grant suited up for 10. This continues a rough season for New York’s linebacking contingent. Big Blue attempted to bolster its group on Monday by claiming Ray-Ray Armstrong off waivers. The Giants announced that they have reinstated cornerback Janoris Jenkins. It was just one week ago that Jenkins was handed an “indefinite” suspension by head coach Ben McAdoo. Jenkins was banned from the team when he missed last Monday’s meeting. 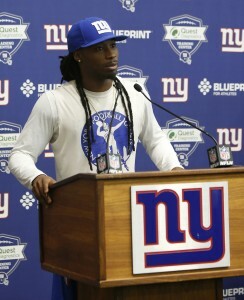 Initially, the Giants said that Jenkins’ absence was excused. Later, McAdoo told reporters that wasn’t the case. Jenkins’ act-out marked the second time a Giants star has publicly disrespected McAdoo. Just weeks ago, fellow starting corner Dominique Rodgers-Cromartie butted heads with the coach. He too was handed an “indefinite” suspension for conduct detrimental to the team. And, he too was reinstated after just one week. We know that DRC had some issues with McAdoo specifically, but it’s not immediately clear why Jenkins missed last Monday’s practice. The Giants are 1-7 after a 51-17 drumming at the hands of the Rams. In the midst of a disastrous season, it’s fair to wonder whether McAdoo will be brought back for another. In related moves, the Giants signed linebacker Deontae Skinner off the Raiders’ practice squad and waived defensive end Jordan Williams and defensive back Tim Scott. Linebacker Nigel Harris (ribs) was placed on injured reserve. For the second straight season, J.T. Thomas won’t make it out of September because of an injury. The Giants placed the veteran linebacker on IR, per Paul Schwartz of the New York Post (on Twitter), potentially ending his season. The Giants also waived fullback Shane Smith. Linebacker Deontae Skinner and defensive end Nordly Capi will replace the duo on the 53-man roster, per Schwartz (on Twitter). Thomas signed a three-year, $12MM deal in 2015 but did not live up to it largely because of lack of availability. The former Jaguars linebacker started 11 games that season but has played in just three since. His deal expiring after this season, the 29-year-old second-level defender won’t have the same kind of free agent market he did when he inked the Giants accord. He accepted a significant pay cut before the season, reducing his 2017 salary from $2.96MM to $775K. He was set to receive a $400K bonus if he participated in 70 percent of the Giants’ snaps, which looked like a long shot at the time. Skinner played in four games with the Giants last season.